LEX Give to Charity ! My passion for singing draws me back to Italy, where I am honored to perform my 7th Concert Tour! 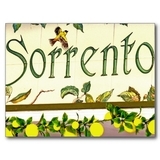 I am inviting all my fans to join this exclusive journey and "Return to Sorrento" where I will perform three private concerts in magnificent venues dating back centuries! My 2019 Concert Tour will be a culmination of my career, and I hope you will be there to celebrate with me! where that song was conceived in a precious magical setting. where Ulysses could not resist the 'Song of the Sirens'. 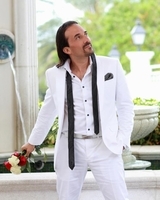 Be lured by that mystical music in harmony with "The Voice of Romance"! Franco performs 'Caruso' and 'Torna a Surriento' where they were composed! 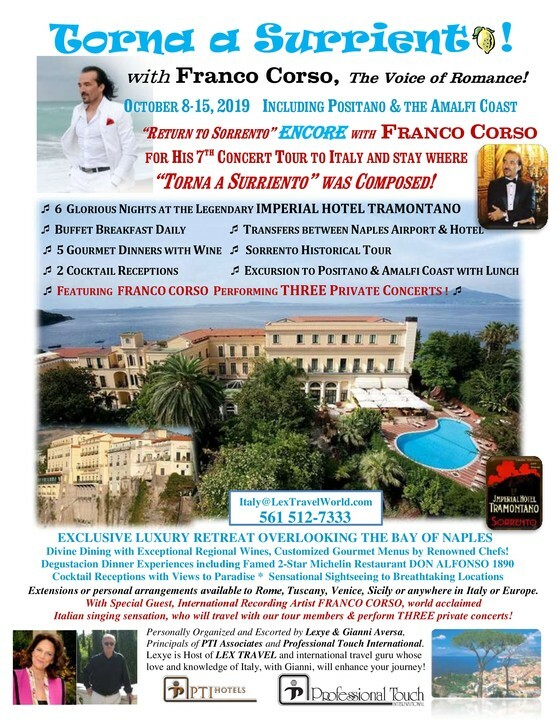 unforgettable Franco Corso concert tour to Italy - one week of passion! Your Fairy Tale comes true within this Fantasy Journey! 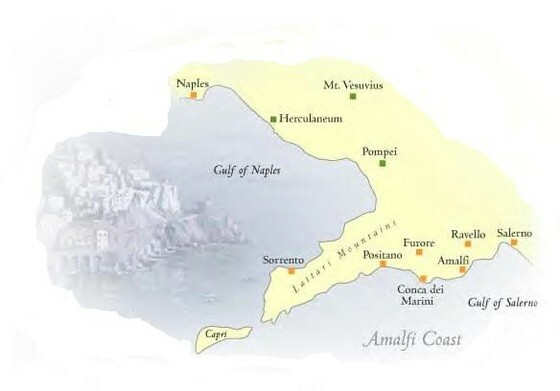 perched above the Bay of Naples with Mt. Vesuvius as a majestic backdrop, with lush gardens, large swimming pool & glamorous lounges. Catch a Glimpse of Paradise and Hear Mandolins in the Breeze! * 3 EXCLUSIVE CONCERTS BY FRANCO CORSO IN HISTORIC PALAZZOS! Enjoy an unforgettable dinner at 2-Michelin Star DON ALFONSO 1890, with the #1 Chef in Italy who will create a "Gastronomic Fantasia" for us from his farm which is next to the UNESCO World Heritage site..... with wines from the most famous Wine Cellar in Europe, a former Roman Tunnel! The Chef Proprietor, our lifelong friend, is a Knight AND received the Commendatore highest honor tribute bestowed from the President of Italy. He personally oversees the food operation at our hotel - so just imagine the extraordinary special Gala Banquet there! or anywhere on our planet!